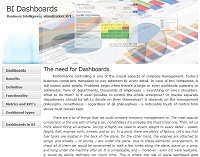 Details: The Business Intelligence Dashboards portal provdes a number of articles covering various aspects of Management Cockpits, Metrics, KPIs, visualizations and balanced scorecards. It is a knowledge base for both business and technical users which guides them through the most relevant aspects of designing performance dashboards for the enterprise, provides examples and real-life cases. High attention is paid to the use of dashboards in Business Intelligence and Data Warehousing and how do they relate to reporting, analysis and planning.